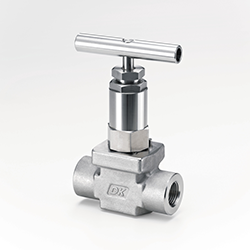 The DK-LOK® V43 Series Gate valve is designed and manufactured to meet a ASME B16.34 Class 1500 pressure rating. Available in a variety of end connections; 1/8″ OD – 1” OD DK-LOK® compression tube fitting ends, 1/4″ – 1” Female NPT end connections, also 3/8” and 1/2″ Pipe socket weld end connections. Every valve is factory tested with nitrogen @ 69 bar (1000 psig) for leakage at the seat to a maximum allowable leak rate of 0.1 SCCM. Stem packing is tested for no detectable leakage.